Ground control to Major Tom. Say it ain’t so. Iconic pop rocker David Bowie is dead at age 69 from cancer. Other than his music, there is something I very much liked about Bowie a/k/a David Robert Jones: despite being married to a Muslim, he never once gave in to jihad, and proudly played Israel repeatedly. David Bowie Lands in Israel & Expresses Pride in Performing There . . . Growing up in the ’80s, I was a fan of David Bowie’s pop music, which generated many top hits on dance and pop playlists. He was among the first rock artists from the ’60s and ’70s to make bright and colorful music videos and use MTV–which was then a new cable network playing only music videos–to aid his transformation from androgynous, revolutionary rocker to pop star and dance hit generator. I loved Bowie’s deep, throaty voice and, though only some of his pop tunes stand the test of time, his songs were catchy and hip in the ’80s, when I was a kid. My friends and I listened to his songs and danced to the at clubs, parties, and Bar and Bat Mitzvahs. I wasn’t that into Bowie’s pseudo-gay act with Mick Jagger, in which they sang “Dancing in the Streets”–a video that constantly played before movies at the theater and was on MTV 24/7. But I liked a lot of his stuff. And I always liked his coolness and swagger. The man was a showman and he successfully morphed his act with the times throughout his decades-long music career. To me, Bowie exuded ’80s cool. He was the epitome of it. And I was a fan. Even with orange hair, an earring, and leather pants, he was suave, debonair, and hot with those stark blue eyes. Bowie used technology, futurism, and space travel as themes and tools in his music, staying ahead of the curve and making an impact. Although some have interpreted his famous 1969 hit, “Space Oddity” (from which the “Ground control to Major Tom” lyrics come), as a statement against nuclear weapons and war, Bowie never meant it that way. That’s only been present when others have taken liberties with the lyrics in their performances of the song. The song was primarily about Bowie’s fascination with space and space travel. And it wasn’t just his singing and lyrics, which Bowie mostly wrote himself. He was multi-talented. Not only did he also write many of the musical arrangements for his songs, he also played many instruments and was an actor and painter. Yes, it is true that Bowie, at one point, collected Nazi memorabilia and was thought to have delivered a Nazi salute in 1976, but that is something he blamed on his drug problems. Bowie was one of the earliest non-Jewish/celebrity followers of Kabbalah (Jewish mysticism), decades before Madonna, and had a Jewish half-brother (the result of his mother’s previous relationship with a Jewish furrier). He also was in a band (“Tin Machine”) with the sons of the late Jewish comedian Soupy Sales. Over the weekend, I heard that Bowie had just released a new album, and I’ll admit that, in my mind, I was skeptical. I wondered what the 69-year-old could possibly do that’s new and interesting, as his recent new material wasn’t that great. But David Bowie made a lot of great music. And it’s good to see that he along with that great music, he had some big cojones and didn’t bow to international pressure to abide by anti-Semitic boycotts of Israel and the Jewish people. That’s more than I can say for many others in his industry. And it says a lot. 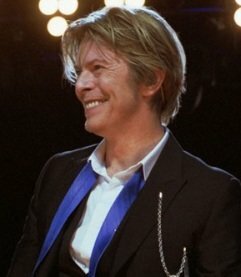 I regret that I never got to see Bowie in concert, as I know it would have been a great experience. My favorite Bowie song: “Heroes.” Love that song. Others I like: the insightful “Fame,” “Young Americans,” and “Suffragette City.” Also, “Golden Years,” “Absolute Beginners.” And don’t forget, “Under Pressure,” which Bowie recorded with Queen. 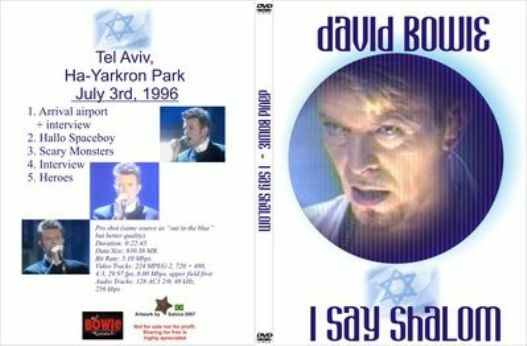 David Bowie Performs “Heroes” in Israel, 1996 . . .
A note about Bowie’s widow, Iman: her father was a Somalian diplomat to Saudi Arabia, and her parents were liberal democrats (small “L,” small “D”) who wanted Somalia to be modern and liberalized. You’ll note she does not cover her hair and, throughout her modeling career, wore bikinis and barely-there clothing. When more extreme Muslims took over Somalia, her family could not go back, and that’s how they ended up in the West. She told the Guardian that she was teaching her daughter (with Bowie, named Alexandra “Lexi” Zahra Jones) about the Holocaust and having her read Elie Wiesel’s “Night” for Holocaust Remembrance Day. Given all these things, I’m sure she is not well-liked by Muslims. And although she says she does not speak out against female genital mutilation in Somalia because it “is not my thing,” she has spoken out against the extremist Muslims and brand of Islam that controls Somalia and is trying to change it by educating girls(good luck with that “Oprah solution” – which only creates “educated” extremist Muslim girls). What has happened to women in Somalia? When I was growing up women wore traditional clothes or regular western clothes. We went to school. But the schools don’t exist any more. And women are not even allowed to drive any more. It’s run by extremists. Somalia was 100% a Muslim country, but it had its own culture before it adopted Islam. So you were a Muslim, but you were a Somali first. Um, you’re never anything but a Muslim first in Islam. That’s the problem. You either have Islam–and extremism, death, and destruction. Or you don’t have Islam. In any event, David Bowie’s wife seems to be one of those scant few “moderate Muslims,” usually an oxymoronical phrase. And she clearly didn’t do anything to stop her husband, the late David Bowie, from doing the right thing and playing in Israel. That counts for a lot. The reason he became David Bowie in the first place was due to the popularity of the late Davy Jones within The Monkees. I have a few of his 45’s – “Space Oddity,” “Rebel Rebel” (the edited, remixed single version), “Fame” and even “Golden Years.” As well as the Young Americans LP. Notice none of what I have of his is past then. And it’s interesting that today, none of his two children use the Bowie surname (his son from his first marriage [to the woman referred to in The Rolling Stones’ hit “Angie”] initially christened “Zowie,” today goes by the name Duncan Jones). In the respect of his regularly playing Israel, Bowie certainly differed way much from the Elvis Costellos and Roger Waters’ of the British entertainment world. Bowie’s wife came from a generation that aspired to join the modern world. Iman and fellow Somali Ayaan Hirsi Ali are indeed the rare “moderate Muslims” and they’re rare as a hen’s tooth today in the Muslim World. Its no small thing to leave your country and culture and find freedom and opportunity in the West. Sadly, its increasingly the exception rather than the norm. The absence of decent people in the Muslim World is why its regressing back to the Dark Ages. And that is not going to change in the foreseeable future, its handful of Imans and Alis notwithstanding. Debbie, you’re a pathetic crusader-yank, with the same zealot crusader pig-eating terrorism in you as your filhty crusader ancestors. Go bomb a country, or support a dictator, devil. David Bowie was a proud Muslim. Does that hurt you, Zionist-nazi?? Ali? Take your meds you deranged islamofacist. Support a “dictator devil”? Why would she support Allah aka Satan? The author clearly has a bone to pick with Muslims in general, and has to reconcile those before writing. It doesn’t help to flame the fire. To the Muslims above, it would help if you could write in intelligible sentences. Poor Yossi hasn’t figured out that the writing style of those he protects derives from a mainstream Muslim identity. In other words, they write “unintelligibly” because they write from an Islamic orientation. The overwhelming majority of Muslims are extreme, hate us and our values. What I wrote and the reaction of the Muslim poster reinforce that point. Its too bad in our society people prefer not to deal with unpleasant facts of life. Denial doesn’t make them go away. Sadly another piece of my childhood has died. I remember watching him on MTV with my Dad and my brothers and sister. We all rocked out to “Dancing In The Streets” with Bowie and Mick Jagger. That was back when MTV actually showed videos instead of the crap they show now. I was also surprised and glad to hear that despite him being married to a Muslim that he didn’t “knuckle under” and not play in Israel. That shows that he had courage unlike most of the people in the entertainment industry. Like most of those morons at last nights Golden Globes. Thankfully football was on instead but I digress. May David Bowe rest in peace because he helped make the 80’s fun and made me want my MTV. Any time you see a non-Muslim man married to a Muslim woman either the man is secretly a Muslim or the woman is a completely non-practicing Muslim. Islamic law states that the Muslim is the highest creation of allah and therefore can not be subservient to a non-Muslim. Which is what happens in marriage, the man is over the woman (well, that’s the way its supposed to be). I’ve never heard any rumor that Bowie was a closet Muslim. So my money is on Iman being a MINO (Muslim in name only). Bowie did show guts by performing in Israel. Also, as noted by Debbie, Bowie never succumbed to the nostalgia trap, but kept renewing himself with each decade. The camera does not show the reporter asking the question. The reporter does not identify which station she represents. David Bowie appears to be answering this question while speaking into a “Gal Galatz” microphone. Whether accurate or merely media manipulation, this implies the question was posed by a Gal Galatz reporter. Gal Galatz is the IDF Radio. One does not ordinarily associate the IDF with “the far-left.” Just sayin’. Dear Debbie Hi! Thanks for sharing! A Very sad day for me and all of us who loved David Bowie and his superbe songs!David Bowie was a reall man with a great heart! David will be missed tremendouslly! I grew up listenning to his beautiful music! I Lit up a candle for David and as you know well Dear Debbie how much i Love America(USA) and how much I Love Israel!so I related to David very much so! Rest In Peace David Bowie! We Love you! Tirdad Gharib! They all are since Allah is the god that hates. Like all great innovators he will be missed in person but his work will live on (unlike great Islamic innovations ,of which there are none) . Thank you for being so kind as to write to me and do please write again and let me know some more about yourself. This affected me. I’m not sure why. He’s just writing back to a fan. But he connects. There is nothing artificial or “star” or look at me about it. Just human to human. Yeah, very human, and I feel the loss of him. The letter is very sweet! Can you imagine any ‘rock star’ of today writing that letter? They just don’t make them like that anymore. Granted, he was replying to his first US fan letter, but he didn’t have to do that. IMO, it reflects that he was a thoughtful person. Some things cannot be faked and Bowie had a genuineness about him. On Sept 22, 1972 Bowie kicked off his first US tour in Cleveland, at the Music Hall – seating capacity of 3000 but about 2500 seats were empty. Bowie came out by himself in his makeup and saw so few people and announced that as we were obviously fans, they would do the entire show. He asked everyone to leave their seats and come down towards the stage so he could sing to us, which we all did, so I was sitting maybe in the 2rd of 3rd row in the center of the orchestra. The band then did their entire “Ziggy” show and since we were so close, we were hearing the music from their amps and not through a huge sound system. I was maybe 15 feet from the stage. He did the entire show, took his encore and then asked everybody not to leave. He asked us to give him a 15 minute break to get the makeup off and catch his breath and then he’d do some more music! He and the guitarist Mick Ronson, brought 2 stools out to the stage with acoustic guitars and Bowie announced that since we were fans, just call out a song and he and Ronson would do them for us. And he did. They spent about 2 hours doing songs from the earlier albums like Space Oddity and Janine, talked freely with the audience and told us what certain songs were about. David Bowie has put out some really good albums over his career, but there is a difference between live music and recorded albums. The fact was that live, he had the most incredible, real trained voice I had ever heard, one of the best if not the best. He didn’t use a mike and he filled the place. Nothing recorded does justice to his voice. He literally looked at us and answered questions. My respect of him sky-rocketed and I followed his career throughout my life, some albums I really liked, others less but he was an original. He was a true innovator and a true artist. His death really saddens me. Back in Dec. 1980, I had the chance to see him play Joseph Merrick in The Elephant Man on Broadway. I’ll never forget the moment he appeared onstage; naked except for some type of oversized loincloth. He wore no disfiguring makeup or prosthetics. There was a small projector screen showing medical photos of the real Merrick’s various physical deformities. The actor playing the doctor would point to the screen and then describe each of the bodily malformations. As the doctor spoke, Bowie contorted his physical form into Merrick’s: one weak, useless palsied leg; one strong. One arm much longer and more capable than its withered mate. He stooped just a bit and slightly to one side to become a hunchback. By the time the doctor stopped speaking, Bowie was Merrick. And I was transfixed. The play was magnificent; full of pathos (as you might imagine), but also chocked with wry humor and an overarching message about real beauty and what a gift it is to be alive. To be loved. From that first moment we knew we were seeing something absolutely unique and that we’d never see again. 35 years later, it still ranks as one of the very best nights of my life. A perfect memory. As I said, his loss really saddens me, the way Lennon’s death or Zappa’s death or Miles Davis’s death did. Not sure why there’d even be a question of his view towards Jews. One of his biggest, earliest influences was Al Jolson who was the first real superstar who didn’t keep hidden the fact that he was a cantor’s son. Rod Stewart and many others were also influenced by Jolson. One thing remarkable about Iman is that she did NOT convert her husband to Islam. For that, she would have been regarded as an apostate, regardless of whether or not she ever converted out of Islam. I suspect she may well have been one. Like you mentioned, at the time she left Somalia, it was not an Islamic hellhole the way it is today. Both as a model, and as someone who married out of Islam, she didn’t fulfill her Islamic duty to be a tilth to her husband. That’s a good part of why she’d be hated. Since I was born barely in the 1970s (the late 1970s to be precise) and into the early-1980s, I as a kid growing up in the 1980s remember Mr. Bowie’s music, ironically since Debbie is kinda apathetic on it (which it’s Ms. Schlussel’s opinion), my favorite Bowie song happens to be with thee “Mick Jagger” of their song “Dancing In The Streets” from 1985. 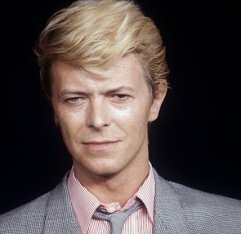 As time progressed in my life, I didn’t follow David Bowie that much, as I knew he was still being active in the entertainment establishment of being an artist. It’s good that to his own credit that he performed in Israel and brushed off of all of the “ad baculum” logical-fallacy boycotts from Muslim and Arab front-organizations, etc. 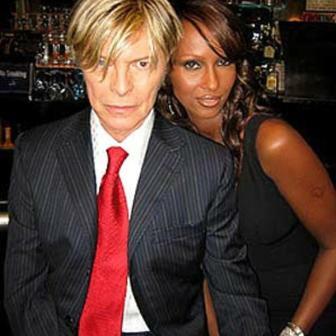 Nor I wasn’t sure that Bowie had married a Muslim woman, but as our pal “NormanF” interprets, his Muslim wife happens to be from a generation where when they were young people, they used “logic”, “reason” and “critical thinking” of adapting into our classic-liberal constitutional-republic here in the US and not like a good number of the Muslim community these days who are intrinsically brainwashed and committed into idealistic dogmatism! Show some respect, a man has just died. The majority commenting here only seem to care about their own self-important, ‘trump’ed up views on what it does or doesn’t mean to be Muslim. Yawn. Its blindingly obvious Islamic fundamentalism is a reactionary movement. Responsibility from all sides is sorely lacking. Wrong, Homo S, the majority here clearly appreciate and respect David Bowie’s work. Your only point is to try to squeeze in an apology for the continuous daily and nightly Islamic atrocities. Stick with posting on the websites of Stormwatch, David Duke, and Loonwatch, where you’ll feel more comfortable with their political objectives and where they don’t care about reality. Wrong, Homo SS, the majority here clearly appreciate and respect David Bowie’s work. Your only point is to try to squeeze in an apology for the continuous daily and nightly Islamic atrocities. Stick with posting on the websites of Stormwatch, David Duke, and Loonwatch, where you’ll feel more comfortable with their political objectives and where they don’t care about reality. So she is probably an Apostate for all practical purposes, and the only thing that kept her safe is the fact that she’s the wife of a celebrity. You really are deluded. My mother is English, my father is Pakistani. My sisters and I are married with children to people of all nationalities and of faith and non-faiths. You sit behind your computer, insulting my family as if you have any real idea what ALL Muslims believe, think, feel. You have not a clue. My gay cousin and her wife live with their adopted daughter in Paris. We are human beings and each of us has our own subjective path to walk. Why dont you walk yours instead of stomping your filthy boots all over mine. I balked out loud at some of the pathetic attempts above to employ Arabic as if the terms you use are inportant to ‘All Muslims’. They are important to you. Thats it. You don’t even realise what a Homo Sapien Sapien is (facepalm). And for the record; a Dhimmi paid less in tax than any Muslim and had freedom to openly practice their various faiths as is testament to the number of Jews and Christians living throughout the ME and NA before the Israeli pogroms. FFS you think i want an apology from you? You’re just an idiot on the internet. And thats exactly it. This whole problem is down to idiots. Idiots radicalising people on the internet. Justifying murder through their own self importance. You and the extremists are fuel for your own fires. It saddens the hell out of me that my kids and I have to watch you destroy each other. I live near London. If you do and want a cup of tea and a chat as humans. Homo sapien sapien. I’d be more than happy to have you at my home. Salam. Shalom. Peace. PS. One of the first songs I was really proud to have learnt on the guitar was Ziggy Stardust. Grew up watching Labyrinth. Thanks for the memories. Rest well. One of the first songs I was really proud to have learnt on the guitar was Ziggy Stardust. Grew up watching Labyrinth. Thanks for the memories. Rest well. And if you were trying to point out that Debbie never misses an opportunity to tell the world what a horrifying, pretentious, phony pile of crap Islam is, you’re right, and I support her in doing that. Islam is not a religion. And there really is no such as thing as religion anyway, since almost all the world’s religions, including most sects of Christianity, were invented by humans. There is ONLY God. And God Almighty has nothing to do with Islam. Islam is not a religion, it’s the world’s largest gang. Among the 1.8 billion Muslims in the world, of course there are good people who have ignorantly embraced Islam in their search for a spiritual home. That doesn’t make Islam a good thing. It’s not. Study, study hard. Islam and an enormous percentage of its followers support the total subjugation of all peoples worldwide under it’s banner, and that, in the immortal words of Bill Murray, from the movie Stripes, . . .
“. . . is the fact, Jack.” Of course the phrase existed long before Bill Murray uttered it for the movie. A quote from the Bible, the ONLY word of the ONLY God. “Salvation is of (for) the Jew first, then the Gentile.” Nothing in there about Islam, never has been, never will be. ‘You either have Islam–and extremism, death, and destruction. Or you don’t have Islam’. Really and where did you get that from Israeli soldiers back pocket? Debbie – are you thick?, but your a lawyer… but they lie so well 🙂 If you don’t know anything about Islam why don’t you just STOP spewing. Could it do with you being a Zionist? Haleema, have some baba ghannouj. Another one from the party of the fair and balanced. Why do you think that Zionism is a bad word? You talk as though we’re all going to cower in fear of the word, as though that’s going to stop Debbie or any of the regulars here in their tracks. Wake up, get some sense, and let us know how you enjoyed your lunch. Oh, and stop worshiping that which is not God. It’s a shame that David Bowie’s dead. He should have been around at least a little while longer. I liked a lot of his songs. He deserved a lot longer life than he got. Ghostwriter. You are the ONLY sensible and kind person on this page. I agree his life on this planet was too short. R.I.P. Thin White Duke. Before I start,I want to thank Karl for his compliment. I don’t often get comments on this site,positive or negative. I just wanted to pay tribute to someone who made some great music. It’s a shame that David Bowie will no longer be among us and make his music. I think that THAT’S what’s missing with some of the above comments. Who cares what religion his wife did or didn’t practice. What matters is that David Bowie be honored for the life he lived and the music he made and it’s a shame that he’s gone. It’s also a shame that that got lost over this nonsense over Islam. Before I start,I want to thank Karl for his kind words. I don’t receive any comments on my posts whether they’re positive or negative. I wanted to pay tribute to David Bowie and his music. Some of the comments strayed very far from that. What religion his wife did or didn’t practice doesn’t matter. What matters is honoring the man,his music,and his life. This ISN’T the time or the place for the argument over the merits of Islam. Debbie you talk nothing but nonsense. While Israel has the support of the most powerful countries-US, UK palestine has nothing but their Lord and Israel is failing to eradicate this small country which its people are fighting back with stone-throwing. Its nearlly 50 years but they cannot defeat young men with no military experience, no sophisticated weapons too. Almighty Allah is more powerful than any other entity. So Debbie your words don’t bother muslims as we know all journalists and bloggers are paid by the zionists and jews to create hatred and corruption in the world. We don’t miss sleep for your bad mouth. Hell! To Iman, she is an apostate. She married Bowie just for the sake of fame and money. Shame on her. he talks about how he isn’t afraid… while interviewer didn’t ask any sort of this question. Poor her to cheat the readers! Finally, true muslims are peaceful and they are against what ISIS or others are doing to humanity. But unfortunately world media focus these few bad muslims than greater peaceful muslims. Sorry,Nurkeeh. The Palestinians have largely acted like they’re unworthy of a state. They don’t want to live in peace with the Israelis,they want them DEAD. How are they supposed to deal with that? The Israelis want peace,the Palestinians do not. The Palestinians scream for the death of everyone who isn’t like them. But this has nothing to do with the life of David Bowie. Nurkeeh had touched on a little but he delivers the same nonsense that isn’t germane to the issue. It’s ridiculous and needs to stop. Shame on you for even thinking what you took the trouble to write. Is that really the first thing you thought when you heard David Bowie passed away? Well, thank God that he didn’t marry a Jew, as most celebrities (including Muslim Imran Khan) are bent on doing is all I can say. So he wasn’t afraid to play Israel. Neither was he afraid to marry a (even if in name only) Muslim. Rest in peace David Robert Jones and praying for his family. Having stumbled upon this website due to some research for work I am disgusted at this article and also at some of the comments. I’m a British born Muslim and I can tell you that NO being a Muslim first does not mean that I believe or have to believe in extremism, death and destruction, in fact all three go against the true essence of Islam and unfortunately it seems that the author of this blog piece has not bothered to do any research into Islam but rather believe that the Media puts out there. And to the fellow poster Infidel! I wonder if the majority here are American?? ?